Earn $64.90 in Rewards credit (6490 points) What's This? 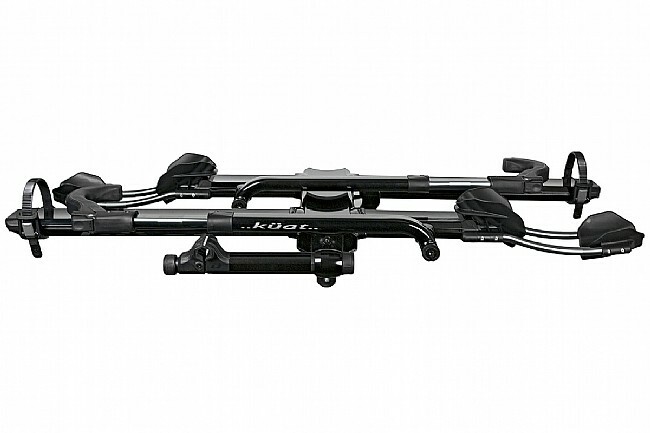 The Kuat NV 2.0 Bike Hitch Rack is the result of fielding years of customer feedback from the original NV, and what they've ended up with is a thoroughly re-engineered rack that works and looks better than ever before. 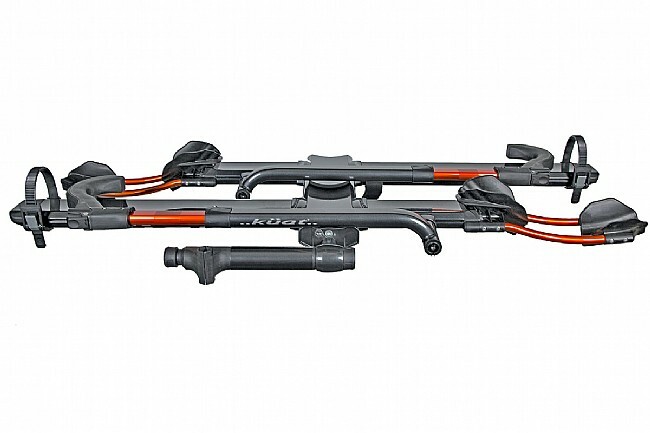 A pivot system includes a foot-operated lever to fold down the rack, and adjustability is improved with 3-position front cradles for getting adequate clearance between your bikes' handlebars and saddles. The NV 2.0 can handle tires up to 4" wide so pretty much any bike is fair game, and the ratcheting arm is more intuitive to operate while providing increased stability. The integrated Trail Doc work stand features a ratcheting clamp with a spring-loaded release to bikes in and out with pro-level speed and ease. When back in the rack, individual locking cables allow each bike to be secured separately, and a locking hitch ensures the Kuat NV 2.0 isn't going anywhere without your permission. Fits 20" to 29" tires (wheel adapter needed for 20-24" tires). 4.8" max tire width (may require Phat Bike Kit straps). Two bike capacity up to 60 lbs each. Rack tilts down for access to vehicle hatch. Can carry up to 4 bikes with optional NV 2.0 Add On. I've owned a number of racks over the years and this is by far the easiest to use, the least stressful on the bikes, and the most flexible with respect to frame style, wheel size, etc. I was easily able to fit a fat bike and full suspension MTB bike together. The rack also has a cool built-in bike repair stand which has come in useful on more than one occasion. The only problem I've had with it was when my wife ran the car through the car wash the day before we were leaving for a cycling trip and the temperature overnight was well below freezing. I had to get out a hair dryer to warm up the front wheel clamps so they would extend. Best rack I have ever used! This is such a easy rack to use. Works well with all sized bikes. Bikes are stable on the rack. I do like the work stand attachment. 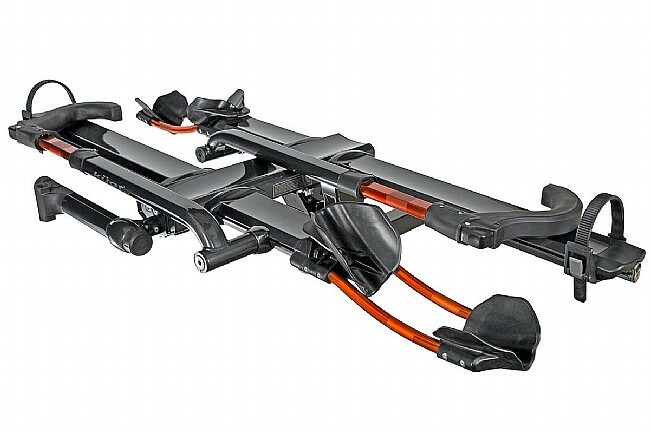 This is one of the best bike racks you will ever own! Very easy to use. Doesn't risk damage to the bike. The built in bike stand comes in handy. Highly recommended. The only con is the weight. On the flip side of that it just goes to show you how well it's made. The rack locks into the hitch so there is no movement what so ever. Built in lock cables for each bike a plus. I've always been a Yakima fan for their quality. This rack is far superior even to the highest quality Yak Racks. It's so well mad I wonder if it's over engineered which has driven up the cost. Sure it is very sturdy but I love that my bike goes on ready to drive in 5 seconds. The cable locks are fairly beefy at 9mm, but I'd never leave a high priced rig out of sight. Still, much thicker than many racks out there. They also have clever details you might miss such as stops to hold the cable locks tucked into place to prevent them from just falling out when setting the rack up for storage. These kinds of things can be a pain if left out at design time. The double carrier is quite heavy. It seems strange to need a 55lbs rack to hold a 17lb bike, but okay. I really like the hitch securing mechanism designed to remove rack wobble. Most hitch racks have a single bolt to pull the rack to one side of the hitch receiver. That stops side-side wobble but up and down is completely uncontrolled. 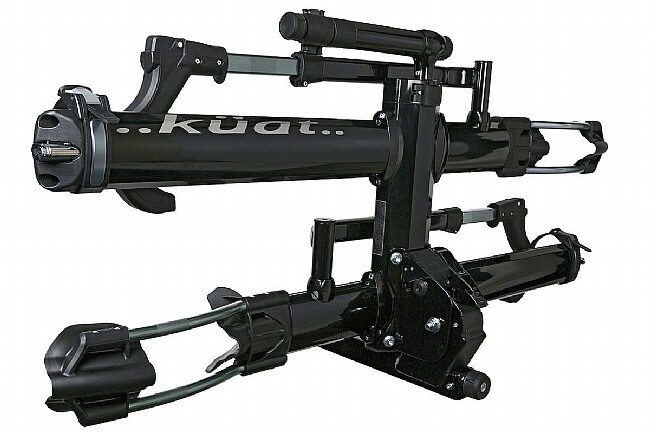 Kuat designers most cleverly use a steel ball that engages the corner of the square hitch receiver on the inside. This contacts 2 sides of the receiver hole so it does not flop up and down or side to side. And you don't need a wrench to secure it. Brilliant. The finish is also top notch and looks great. 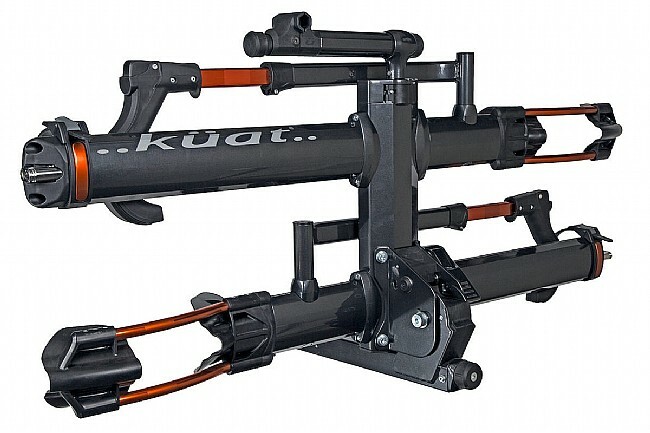 Did some research and came to the conclusion that the Kuat NV 2.0 Bike Hitch Rack would be the best solution for us. We transport road and fat tire bikes. It's easy to put on the car, easy to fasten the bikes. It's a very solid good looking hitch rack. Very happy with our purchase. Expensive, sturdy, but has some faults. Otherwise a very good rack. Nice sturdy rack. No movement in the hitch when internal cam wedge applied. Will NOT WORK with F 150 pick up if you want to lower tailgate. Front tire trays hit and will dent tailgate. You will need to load your truck first and then put on rack and bikes unless you want to climb overside of truck or tailgate to access your bed storage. Bikes are secure when properly mounted. Self stored locking cable not long enough to reach frame of bikes, good only to lock front wheel. Hitch lock ok, but would be better if lock was integrated into knob that you turn to set cam wedge and disengages like the Thule rack. Then a would be thief couldn't just cut locking pin and walk off with whole rack and bikes. Still a very good rack and holds 2 heavy bikes 50 lbs each with ease. No rack is perfect. You have to pick your preferences. Removed 1 star because cannot lower pick up tailgate with rack on truck and also there could be a better engineered hitch lock to prevent someone with grinder or cutting wheel to cut off lock and walk away with all your gear. Fantastic design with great function. This rack is pricy but is worth the money. Absolutely rock solid construction. You will never need to worry about enroute damage from bikes rubbing against one another and loading and unloading is really quick and simple. The only down side is weight and storage considerations. 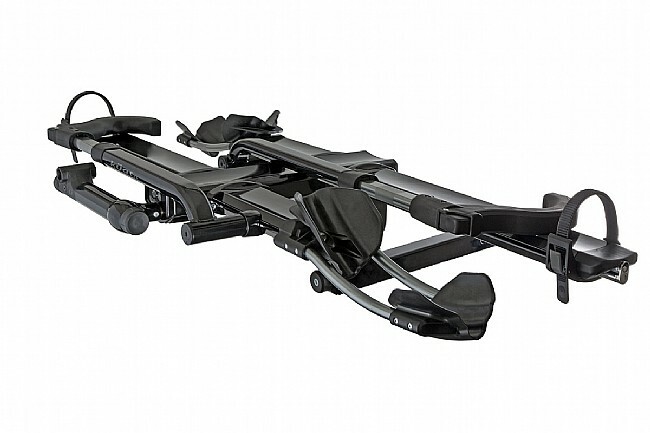 In the four bike configuration the rack is really heavy and will add four feet to the overall length of vehicle.